Using AM, Audi can integrate internal structures and functions that it has not been able to create so far with conventional manufacturing methods. Automotive giant Audi AG and 3D printing pioneer EOS plan to build a 3D printing center near Audi’s headquarters in Ingolstadt, Germany. ‘The aim is to not only supply Audi with the right additive systems and processes but to also support them during applications development, when building up internal AM knowledge and training their engineers to become in-house additive manufacturing (AM) experts,’ said Güngör Kara, director of global application and consulting. Audi says that it is also focusing on the production of inserts for die casting molds and hot working segments. The company can positively influence the process of series production by conformal cooling, producing parts and vehicle components more cost-effectively. This is made possible by using more complex additively manufactured cooling channels, which are tailored to the component and could not be implemented conventionally before. According to the company, the improved cooling performance leads to a reduction of the cycle time by 20%. 3D printing company EOS is now offering European distribution of three polymers for additive manufacturing (AM). 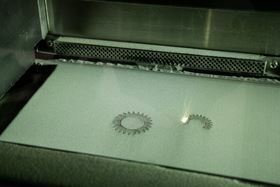 EOS has released a new version of its additive manufacturing (AM) CAM environment, EOSPRINT 2.0.